In every grade of every year at school, it is required that you take a test. Sometimes the test covers the material you studied in class that month. Sometimes the test is cumulative and covers the entire marking period. You are tested in every class at every grade and each passed test is the prerequisite to take the next one. There are no shortage of tests, and every one affects not only your grade in that class but your overall grade point average (G.P.A.) in school. So important are these test results that a college or university can accept or deny your application based on how well you score. Even well beyond the k-12 educational system, you continue to be tested. To drive a car, you must pass a test. To play a sport, you must pass a physical exam. To become a doctor or nurse, you must pass the boards. To become a lawyer, you must pass the Bar. To sell real estate or insurance, you must pass a test to obtain your license. Today, most jobs even require you to pass a drug test for employment. You know it’s a test. You may not have had any advanced notice it was coming, but you certainly know it’s a test while you are taking it. The test is for the teacher’s benefit – to see what you know. The test is designed to be hard. Test results matter. How you score is important to the test giver. Your future is often determined by the result of the test. You rarely know it’s a test from God when you are in the middle of it. Too many of us realize it was a test long after we failed it. To you it feels like a long line at Walmart. He’s merely testing your patience. To you it is just an annoying co-worker. He’s just testing your ability to love difficult people. To you it is just being over-worked and under-thanked. God may be testing your servant’s heart. If we knew it was a test, we would make sure we were “on.” God doesn’t want us “on” for a test and off when it’s finished. He wants us “on” Friday nights AND Monday afternoons – not just on Sunday morning. He wants us “on” at work and at home and while you are grocery shopping – not just when the preacher is looking. His tests are daily and subtle so that we can’t possibly study or cheat. We are normally so caught off guard when He delivers His test that often we can’t even detect it’s happening. Because of this, the test results are pure. His tests are not designed to test your knowledge. God does not care about your degree of skill as much as He cares about your motives. He doesn’t want to know how many Bible verses you know. He wants to see how many you obey. His tests focus on your character and integrity. They often occur when you are alone. Man tests the mind. God tests your heart. His tests are not for His benefit, but for yours. He already knows what’s in your heart. He already knows how you are going to respond. He already has your test score completed – long before you even took the test. His tests are perfectly suited to you. The test is for you to guage where you are and what you need to do to improve. Like other tests, His are designed to be hard. Anyone can pass an easy test. Easy tests do not prove what you are made of. God has no desire to develop soft students. He wants to raise up men and women who can pass hard tests, like Job. Like other tests, the results matter to God. He is extremely interested in whether you pass or fail. Like it or not, He linked His name to your test result. 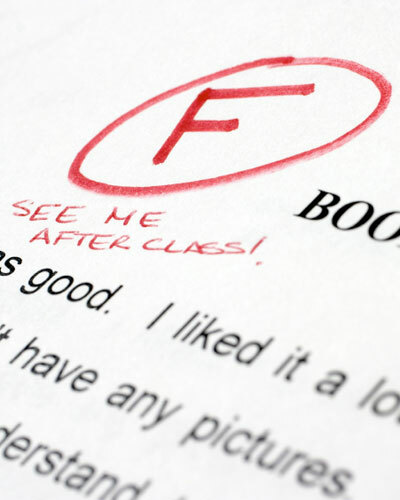 If you fail, His name gets the “F.” Just as a child’s behavior reflects on the parent, so our test results reflect on Him. When David committed adultery with Bathsheba, God was gracious to forgive but one of the consequences was the loss of his child. The reason? Because “by this deed you have given occasion to the enemies of the Lord to blaspheme.” (II Samuel 12). In other words, David failed the test and God’s name was drug through the mud. There is always a steep price for that level of failure. Like other tests, your future is often shaped by them. Man’s tests are physical but God’s test are always spiritual. Our tests can be passed by knowledge, intellect and studying. God’s test can only be passed with things like prayer, faith, character, motives & integrity. As a result, the stakes are higher. If you fail a school test, you may fail the course or not graduate. If you fail one of God’s tests, you could lose your job or family or reputation, or damage your character or worse. I have failed too many tests in my day. On one level, I do regret every “F” for who really likes to fail? Some of my failures have really impacted other lives and that is hard to live with. The truth is, there are more lessons in failures than success. There are many days I wish I knew less. On another level, though, I am grateful for my failures as they have taught me things that victory and success cannot. I’d like to think I’ll never fail another test. I have a feeling that’s not realistic. My goal is to not make the same mistake twice. Perhaps you have failed too many tests as well. Be encouraged for tomorrow is another exam. Maybe you’ve even made the same mistake twice. Or three times. Regardless of how you did today, you can get a brand new grade tomorrow. Recognize your failures. Own them, and study where you went wrong. Re-think how you would do the test differently, if given the opportunity. Ask God for help. Find someone to hold you accountable if you think you might fail again. And be grateful for the lessons, no matter how big a price you paid for it. God may use the lesson in your life to help others one day. If nothing else, He is using today’s test to develop tomorrow’s faith.